July 22nd: Ireland Secretary, Jimmy Kelly, confirmed that his union had today agreed to work with Translink management in an Efficiency Steering Group which will implement off-setting measures which will protect bus and rail services across Northern Ireland. “Unite took strike action on March 13th to defend public services alongside other unions. In the week before our bus and rail workers took a second day’s strike action (on May 6th), the First Minister, deputy First Minister and DRD Minister took up our offer to identify off-setting efficiencies and we were able to call off our planned action. “Translink and the Northern Ireland Transport Holding Company (NITHCo) supplied us with information on their running costs and we have spent the last weeks and months analysing these. At the end of June, we brought forward a range of proposals for off-setting efficiencies which would safeguard bus and rail services and meet the £7 million shortfall to the public transport subvention. Today, DRD has agreed that Unite and Translink can work together to deliver those efficiencies and that previously planned cuts to bus and rail services will no longer be necessary. 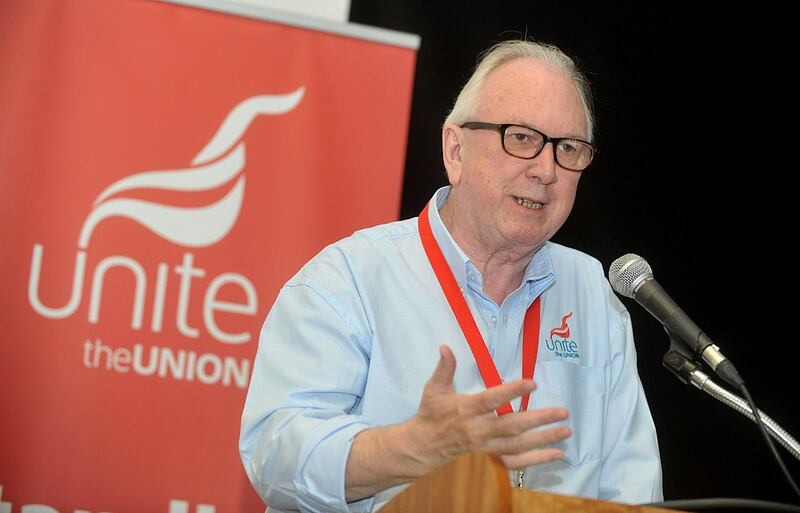 “Unite remains completely opposed to all cuts to funding for public services but have acted to prevent devastating cuts which would have impacted both frontline workers and the travelling public. While the company will still bring forward service adjustments at the beginning of September, these have been reduced very substantially. No communities will lose access to public transport and no services will be removed without alternatives being provided. No front-line workers, drivers or engineers, will face the threat of compulsory redundancy and Translink will not need a voluntary exit scheme. “Unite is committed to defending the integrity of our publicly-owned, public transport company. We will work with management to deliver alternative savings which will enable Translink to survive the threats arising from continued austerity policies”, Mr Kelly concluded. This entry was posted in Austerity, Northern Ireland news, Press Releases, Sectors and tagged #UniteAgainstCuts, austerity, Jimmy Kelly, NITHCo, Northern Ireland, public services, Public Transport, strike action, Translink, Unite NI. Bookmark the permalink.